Timothy Knapman has written lots of picture books, including Soon, illustrated by Patrick Benson. He writes both fiction and nonfiction, and his books have been translated into fifteen languages. In his spare time, he writes plays and musicals, because he believes that onstage, as between the covers of a book, the real and the fantastical can collide, and that is where all great storytelling comes from. Timothy Knapman lives in England. Joe Berger, the illustrator of Hubble Bubble, Granny Trouble, writes and illustrates books for children and adults. He is also a cartoonist who makes the occasional award-winning animated short film and title sequence. He lives in England with his wife, three daughters, two cats, and a small dog. Visual references to superhero comics and jokes at dad’s expense, as when he holds the tiny family dog over his head like a weight lifter, add to a playful portrait of mutual father-son devotion. 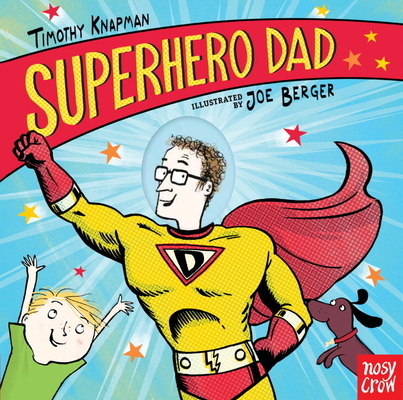 Blazing with energy and saturated with love, this is a cheerful choice for a Father’s Day storytime. Ready to fight boredom in a single bound.